Wine Country Racing Association (WCRA) volunteers are due a grand round of applause for this past weekend’s race extravaganza in Osoyoos, BC. 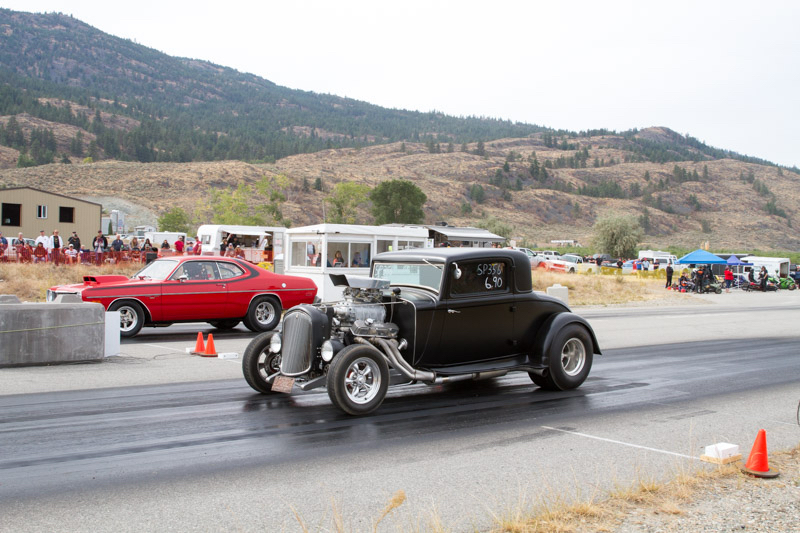 The south Okanagan valley drag racing club hosted their big yearly event, the 8th annual Car Club Challenge. Mountains of fans and race cars swarmed Richter Pass Motorplex. Nitro Dave O’Hara, from Nitro Brothers Racing, had his fuel-altered Fiat Topolino on site to treat the entire crowd to some big horsepower. 106 drivers signed up and made their way to the starting lights, to see what their ride could muster up. Adrenaline surges for the drivers the entire race, with the competitors often not knowing the outcome when they cross the finish line. Cliff Meeds (Oliver, BC) was the man who couldn’t lose on Sunday. Meeds won both the Car Club Challenge as well as the “Fast Four” of all the car clubs, driving his 1969 Chevrolet Pick-up. The racer with the sharpest time leaving the starting light this week was West Kelowna’s Chris Kroening. His1969 Chevrolet Beaumont had no problem moving down the track with his nearly perfect .501 reaction time. The sportsman winner, Jim Behnke, travelled all the way from Mission, BC in his 1971 Plymouth Scamp to carry home a WCRA trophy. Gary Conto and his 1967 Chevrolet Camaro made his home of Westbank, BC proud on Sunday, now sporting the title of the Pro Bracket Champ. Shana Cachola, a fairly fresh addition to the Super Pro Bracket (Oliver, BC) drove her 1972 Chevrolet Nova to victory. Speedy Man Warren Brown (Oliver, BC) is certainly accustomed to parking his 2002 Kawasaki ZX12 motorcycle in Winner’s Row. Brown may need to add a room onto his house soon. WCRA has one event left in the 2017 drag racing season. Thanksgiving weekend, Sunday October 8 gives fans a final time to cheer on their favourite racer. Gates open at 9 a.m. Racing begins around 11 a.m. Final elimination round starts around 1 p.m. Pop the turkey into the oven and head down to choose your seat in the grandstands. Concessions available on site. Visit www.winecountryracing.ca for more information.